The Celebrity Silhouette is the fourth in the series of Solstice Class ships and the newest member of the Celebrity fleet. 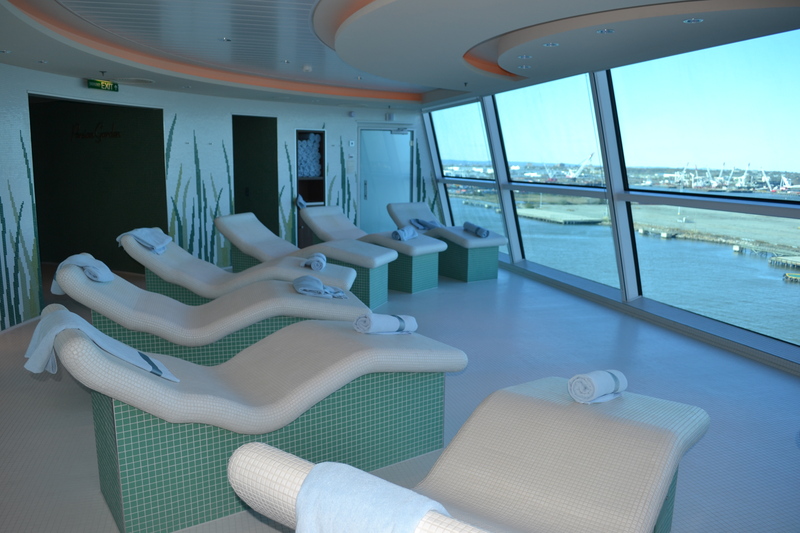 She offers the best amenities of the Solstice Class ships along with several new features. A new feature on the Lawn Club is The Alcoves. Eight cabana style private retreats flank the green grass of the Lawn Club with sweeping views of the lawn, or the ocean. These retreats offer comfortable seating for up to four people with an A la carte food and beverage menu. The Alcoves are available for rental and Wifi is even included! The Porch offers breakfast and lunch for a $5.00 per person surcharge. Menu items are paninis, soups and salads. This outdoor eatery on the Lawn Club seats 48 guests in an open and airy location. The Lawn Club Grille is open for dinner only in a casual al fresco setting with a $40.00 per person sur charge. Each table can assign a “Grill Master” to grill their entrees or have one of the Chefs take over the grilling duties. Steaks, kabobs, chicken, seafood items and pizza are on the menu. Beverages feature wine, buckets of beer and pitchers of sangria. Seating is available for 56 guests. The Art Studio also located at the Lawn Club allowsfor hands on experience and instruction from art and craft experts in drawing, painting, beading and other crafts. Michael’s Club has always been a favorite on the Solstice class ships. However, on the Silhouette, Michael’s Club has a new décor and a wraparound bar has been added with TV screens offer the latest in sporting events. Over 50 international beer selections are available along with homemade snacks. Other favorites onboard the Silhouette include the Library located on Deck ten with its stunning two story high wall of books. Large white leather chairs offer comfort for those wanting to spend some time reading. The Cuvee Dining Room is much more vibrant with a splash of red accenting the chairs and the carpeting. The focal point of the dining room is the two story wine cellar. Breakfast, lunch and dinner are served ordering from the daily menu. If you are looking for something more casual Bistro on Five is a favorite offering crepes, salads and soups for lunch and dinner and breakfast crepes for early morning risers. There is a $5.00 surcharge. So many other favorites are also located on Deck 5: Café al Bacio and Gelateria offering specialty coffees, teas, pastries and gelato is a great meeting spot for early morning or late afternoon gatherings. 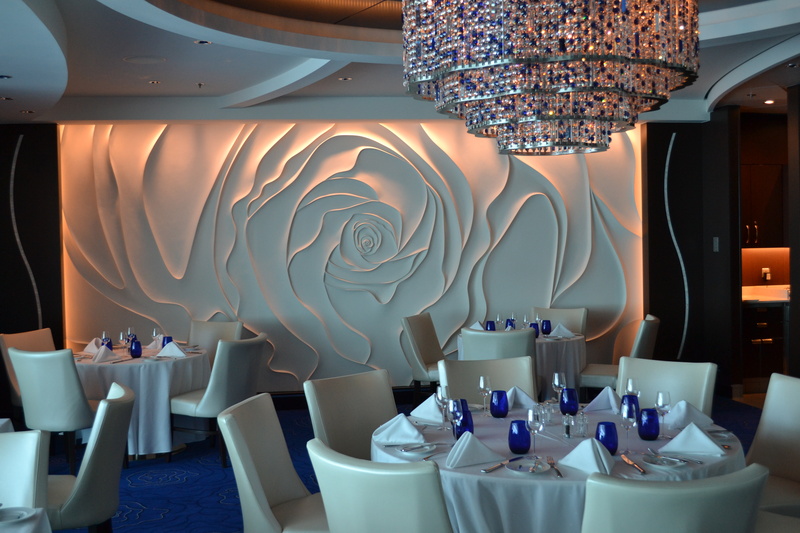 Qsine and the Tuscan Grille located at the aft end of Deck 5 are open for dinner by reservation only. Blu is a beautiful restaurant decorated in white with blue accents for the Aqua Spa guests. The Ensemble Lounge is a great meeting place for pre dinner drinks and music right outside of Murano the specialty gourmet restaurant. Other dining options are the Seaview Café with indoor/outdoor dining buffet style. If you are looking for a hamburger or hot dog try the Mast grill overlooking the pool or for lighter fare try the Aqua Spa Café. 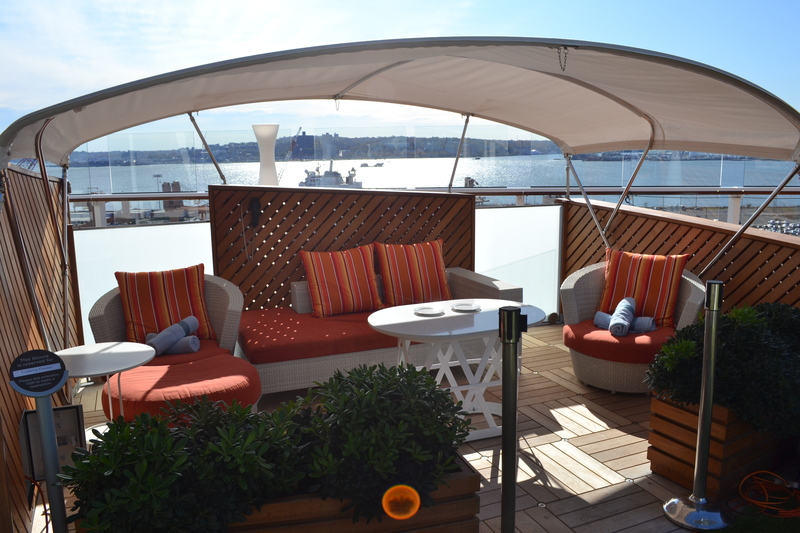 The Martini Bar and Cellar Masters are other hot spots onboard for drinks before or after dinner or the nightly entertainment in the Silhouette Theater. fitness equipment available for daily workout sessions. The Persian Garden with its heated stone beds is a great place to relax and let your worries float out to sea. There is the standard assortment of staterooms available onboard with inside, outside, veranda, concierge, aqua spa and suites. 85% of the staterooms have verandas. There is so much more on the Silhouette that I have not mentioned so you will just have to cruise on her to find out the rest. Give us call to cruise on the Silhouette or any other ship and we will be glad to help!